These (click for big) are the other project that I took to the hospital. I started them on Thursday (and knitted through not one but TWO episodes of Grey’s Anatomy) and finished them on the following Tuesday or so. I’d never made booties before, and these were kind of fun. They are knitted flat, starting at the center sole, and short rows make the toe pop out before flat knitting resumes for the cuff. 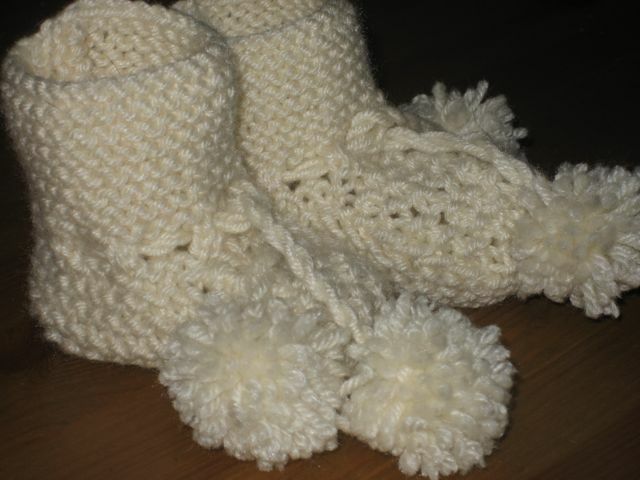 Lots of garter stitch, seed stitch over the toe/instep, one little seam, and that’s it except for the pompoms. This particular pair is a little big; I had a bit of a gauge problem (of the “I didn’t feel like swatching” variety), but this kid has nothing to do but grow, and she has in fact worn the booties twice already. So there. I made this little pair of pants (click for big) today, to go with one of these. They are not quite so blindingly orange in real life (but it’s pretty close). No pattern, just traced a pair of pants and added seam allowances. 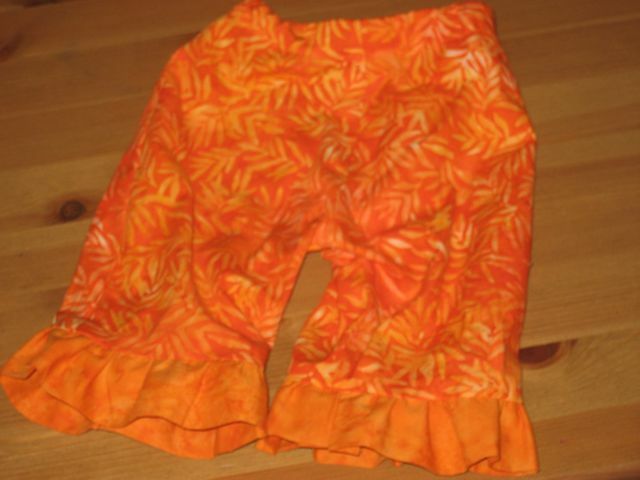 I’m kind of amazed that they fit… though I will say the pants I traced were knit, and there’s definitely a difference in how my version goes over the diaper (the fabric here is a standard quilting-weight batik with no stretch whatsoever). I am exceptionally proud of the ruffle at the hem, and I only sewed it on wrong once (having pinned it wrong three times in a row). Go, me. And in addition to that, I have this to say: Thanks, Mom, for showing me how. I miss you. Everything about this page is beautiful, Christie-the booties, the pants, the thoughts of calling Mom that are so similar to when we would also call Mom. Glad you figured out the ruffle. Thanks for putting everything into words. Love you! It never ceases to amazeme how awesome you are! Love those booties, and the pants. And you.